Following the successful inspection of the new Los Osos sewer plant, a local contractor connected the first home to the plant on Monday. Gellerman Construction, one of about 80 contractors working on the project, plans to connect two homes on Monday. 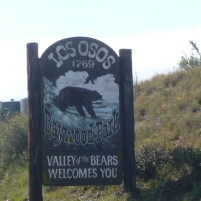 The first phase of connections includes about 1,800 homes and businesses south of Los Osos Valley Road and in the Sunset Terrace, and Cuesta by the Sea neighborhoods. The second and third phases of the project include the Baywood Park area, but that isn’t expected to happen until later this year. It could take several years before all homes and businesses in Los Osos are connected to the sewer. Of course, now the mind-blowingly great question (that no one is asking… except SewerWatch, of course) is: What happens to the property owners that choose (for whatever reason… including the awesome composting toilet argument — which, if argued correctly, could also get them out of paying the sewer assessment altogether [hey, “no benefit, no assessment,” right, Paavo?]) not to hook up? Is that eventually: “Sheriff Parkinson kicking down ol’ Mabel’s front door, slappin’ the cuffs on her, dragging her off to Kansas Ave., and then Supervisor Gibson taking her house away,” time? ’cause, gotta admit, if the County is expecting 100-percent compliance on the thousands-of-dollars-to-hook-up decision (a decision, by the way, that is entirely up to the property owner), then they need to go back to statistics class. Oh, let’s just say, if one half of one percent of the nearly 5,000 property owners in the PZ tell the County to take their little sewer and cram it, that’s still going to be about 25 Mabels. Ian’s knees are going to be sore! Under the current city council, Morro Bay has become the new Los Osos. Cayucos will have a project completed years before Morro Bay does. It’s so sad to see what’s happened to Morro Bay and how much it’s going to eventually cost the taxpayers. NO…they should erect a lead statue of the two Anti-Sewer Shovel Queens who worked so hard to ruin the community.